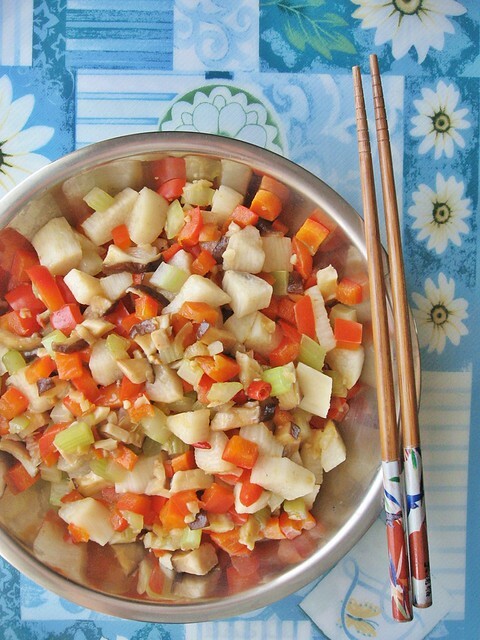 If you enjoy the crunch of Chinese water chestnuts (Eleocharis dulcis), then you may also like the crisp texture of Naga-imo (mountain yam) in this vegetarian stir-fry. 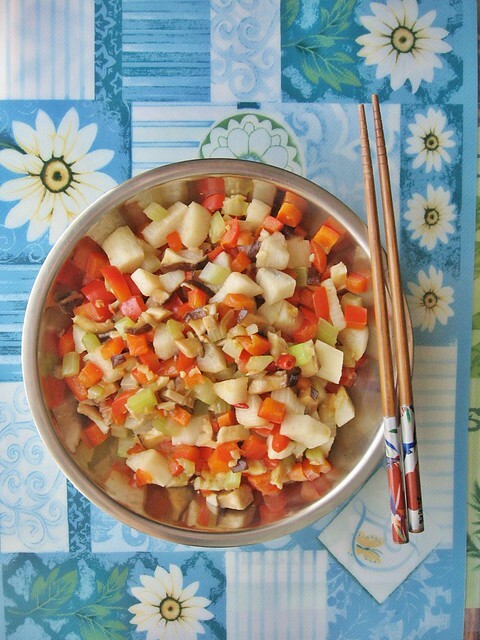 Nagaimo is a good source of minerals, Vitamin B1, Vitamin C and dietary fiber, in addition to micro-nutrients e.g. choline and saponin. Some of these nutritive elements are said to help relieve fatigue. In addition, the viscous substance peculiar to the nagaimo is known to help the body make better use of proteins, aid digestion and fight fatigue. Once the nagaimo hits the hot pan or wok, the sliminess is reduced - just like when boiled in soups, this gluey, almost-mucilaginous consistency is almost gone at the end of cooking. 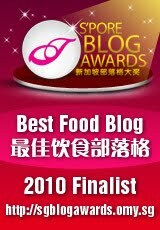 To reduce loss of essential nutrients, nagaimo does not take a long time to cook. 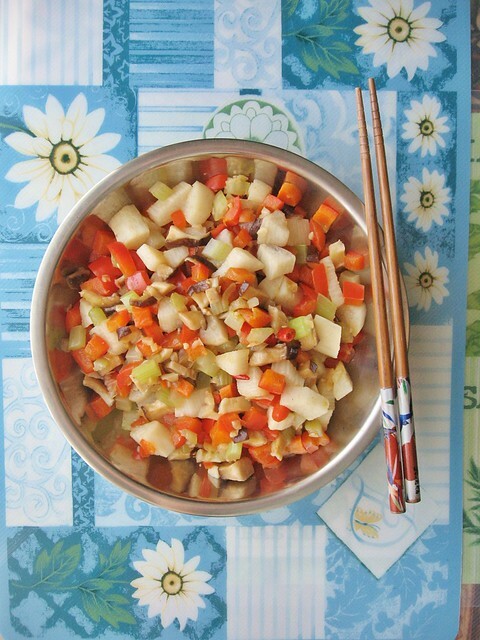 The key to this stir-fry is to add the celery, bell pepper, nagaimo towards the end of cooking (as these three ingredients can be taken raw, so does not need much time to fully cook them), then do a quick high-heat stir-fry to combine all the ingredients and flavors. Directions: Saute shallots, ginger, chili and garlic till fragrant. Add the carrots and mushrooms, add 1 tsp soy sauce, and fry till carrots and mushrooms are tender, about 10 minutes, splashing in some water if mixture too dry. 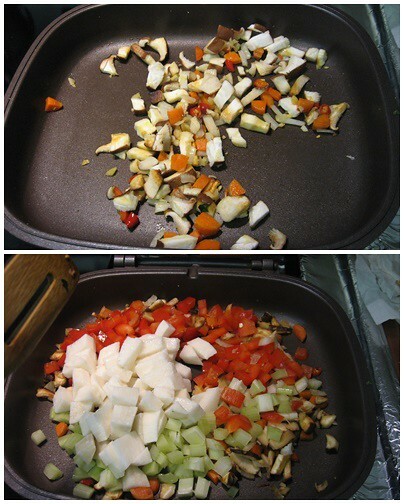 Add in celery, bell pepper, mountain yam and fry briskly at medium-high heat for about 3 minutes. Salt and pepper to taste.